Want to figure out a way to get your kids to grow to love salads? Start by turning them into salad chefs. Follow our simple tips below. One of the best ways to get kids to eat their greens is to grow a pick and eat garden. Lettuce, spinach, tomatoes, peppers, and other salad essentials are easy to grow from starter plants. Pick up starters at your local farmer’s market or garden center. Don’t forget to ask for simple garden tips for your region. Introduce your kids to new salad combos at a restaurant salad bar and encourage experimentation. Ask them to try a new veggie or dressing or combination of toppings on their lettuce. At home, you can then create your own salad bar with bowls of toppings. Think greens (lettuce, spinach, arugula), protein (hard-boiled eggs, cubed cooked chicken), veggies (corn, cherry tomatoes, grated carrots), and dressings. Then let everyone at the table customize their own salad. This makes a fun dinner when the kids’ friends are over, too. Send your kids to school with a little salad. You can make a traditional garden salad and pack it in a lunch container. Or, serve salad on a stick. Put lettuce pieces, cherry tomatoes, cucumbers, and other veggies on a skewer or toothpick. Add one of our Crunchy Croutons on the end. Pack a small container of dressing for dipping. 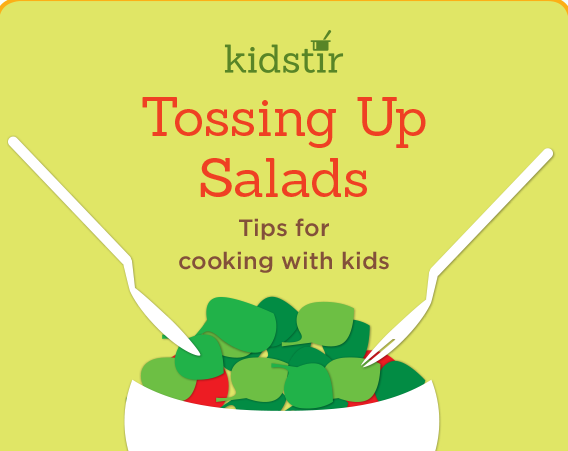 Mixing up salad dressings is a fun kitchen activity for kids. You can follow our recipe for Poppy Seed Dressing or the dressings in the Sunny Salads kit. Or, invent your own. Keep in mind that you’ll want roughly 3/4 cup oil to 1/4 vinegar. You can try different oils and vinegars (and substitute lemon or lime juice for vinegar). Add fresh snipped herbs, crushed garlic, and salt and pepper to taste. Shake it up in a bottle and have kids add a personalized label.